He ain’t heavy , he’s my brother. Passing the bridge ,she’s carrying too much responsibility and too much weight. Look into her eyes and expression . Even more pointed out by the bright colours of the background. Still a child , look at her ‘jubeltoes’ in the pink flip-flops. And the baby ? He\'s feeling so safe and protected , watching the world. Very nice , a whole story , in one picture. another great candid .. it is always great to capture a memorable image "against all odds" .. fleeting moments which never will return .. the angle of the toddler makes the photo so much more dynamic!!! Wow I just wanted to say thank-you for sharing your photos on this site. They are truely all amazing especially the innocence captured in all the children\'s eyes is just so precious. The desaturated background in this image is amazing, something I look forward to learning soon. The story behind "Young Nepali porter"
While we were getting our temperatures measured at the Nepal-Tibetan border -the Chines are afraid of SARS- the stream of porters carries the endless amount of gear and goods across the Friendship bridge. This little girl was walking behind some elderly ladies who were carrying our duffel bags. 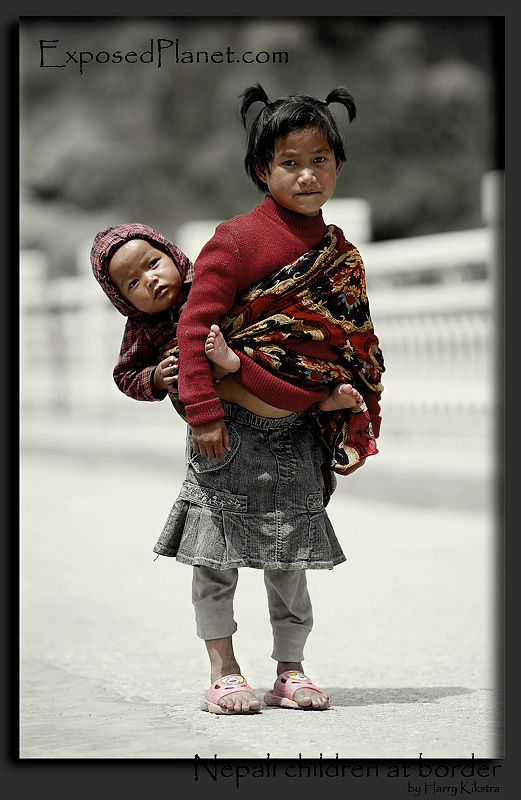 She is carrying her little brother who was not too comfortable as he kept on falling out, but she caught him just in time. I noticed this girl between all those other running around because of her serious look. She seemed wise for her age and though not complaining, showed the harshness of a life amidst the poor hardworking Nepalis. I could just shoot this pic between 2 streams of porters, so her loneliness is more apparent. I desaturated the image a bit, especially the background, though there is little color in the bridge anyway..